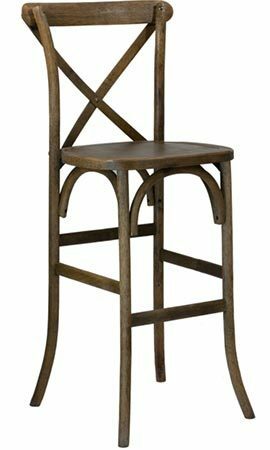 Graced with a natural wood finish and signature “X” on the back, Crossback Bar Height chairs embody rustic elegance and are one of the most popular wedding chair styles for farms, gardens, vineyards, and barn venues. They pair beautifully with our High Top Farm Tables. The Pilgrim Crossback is also available with a natural linen cushion and in standard dining chair height.